Entering the House floor to deliver his annual budget address yesterday, Gov. 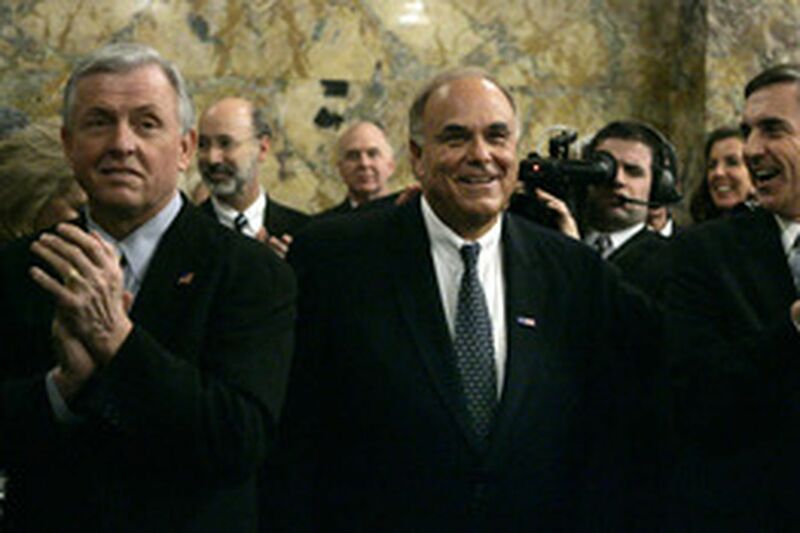 Rendell (center) is applauded by Auditor General Jack Wagner (left) and Revenue Secretary Gregory C. Fajt (right). Do you ever get so busy that you don't know what day it is? Well, you and Mayor Street. Buried in back-to-back meetings all day, hizzoner came out of his warren of offices yesterday afternoon to praise a local cruise-ship line at a small event in the mayor's reception room. As he returned to his offices, the Daily News asked Street for his reaction to Gov. Rendell's budget proposal, which the governor had unveiled in an address to the General Assembly more than four hours earlier. "It's a little early yet. I mean, the budget message hasn't actually been given," Street said. "And so I don't want to start talking about the governor's budget until after the governor actually gives a budget address." Less than an hour later, Street came out of his office to correct the record. "It's a sign that I'm overworked and underpaid," Street said, chuckling. "I was thinking today was Monday. I knew the governor's budget message was on the 6th, but I was thinking this was Monday." Having established the correct day, Street had little of substance to say about Rendell's budget proposal, which this year carried more significance for the city. Last month, Street postponed his own Jan. 23 budget address until Feb. 22 because he wanted to see the governor's budget proposal. Street said he was concerned about how the state would fund the Department of Human Services, which has an array of children's initiatives created by the Street administration. "In the governor's budget, the devil is always in the detail," Street said. "We are concerned about the funding for DHS." But Street, who met with Rendell on Friday to discuss the budget, said that until his budget people sit down with state officials to decipher the details, he won't have much to say. Street's spokesman, Joe Grace, said city budget staff would take time to analyze the impact of the Rendell budget document. Street praised Rendell's call for the Legislature to enact a one-gun-a-month law to reduce trafficking in guns. He said Rendell's plan to lease the Pennsylvania Turnpike and slap a new tax on oil companies to generate money for mass transit and highway infrastructure is a necessity. SEPTA General Manager Faye Moore, in a written statement, said the transit agency was "extremely pleased that transportation had such a prominent place in the governor's budget address today." Paul Vallas, the school district's chief executive officer, estimated the district would get between $22 million and $44 million in new funding. Last year, the increase was about $60 million. Staff writers Mensah M. Dean and Dan Geringer contributed to this report.